Established in May 1979, the Yilan County Cultural Center’s core mission is to promote social education and cultural activities in Lanyang region. Located in Fusing Road, Section 2 of Yilan City, the centre covers a total area of 4.9863 hectares and was officially opened to the public on May 20th, 1984. To accommodate musical, dance, theater and other performances, the center inaugurated in 1998 the very first three-level stage in Taiwan, and rapidly became the focal point of all cultural and artistic activities in the county. 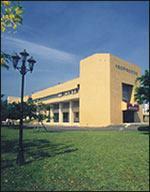 In 2000, the Yilan County Cultural Center became the Yilan County Cultural Affairs Bureau with five distinct departments, including Culture Development Section, Library Information Section, Visual Arts Section, Performing Arts Section, Cultural Heritage Section, and two unique pavilions: the first one being the Taiwan Theater Museum encompassing all aspects of lyrical performances ranging from the origins of the Yilan Taiwanese Opera to recent artistic currents, whereas the second is the Institute of Yilan County History which covers the region’s rich history, intellectual personalities and natural resources. The key building is made of a three-storey re-inforced cement structure including a library, an exhibition hall, an opera artifact collection display-room, a youth library and multi-function venues. The main hall on the ground floor is dedicated to indoor events, exhibitions and special displays necessitating multi-function facilities. Other key exhibition spaces are also available on the ground floor as well as first floor for regular displays, presenting artistic works or exceptional exhibitions. The second and third floors include conference and meeting rooms used primarily for large events, conferences and seminars. Venue:1st Exhibition room: Cultural bureau, ground floor. 2nd and 3rd Exhibition room: Cultural bureau, first floor. Closing Day: Monday / Last day of the month (cleansing day) / Public holidays. Ground Floor: Periodical reading room, reference room, audio and visual room, children’s room. Second Floor: Publication storeroom, new publication showroom. Third Floor: Publication storeroom, foreign language books, periodicals borrowing section, expired periodicals, newspapers and fine books. 1st Exhibition Hall: Ground floor, focused on thematic exhibition. 2nd Exhibition Hall: First floor, focused on puppet and marionette theater. Outside the exhibition hall, leisure and familiarization areas allow the public to experience the pleasures of operating puppets. 3rd Exhibition Hall: Second floor, focused on Taiwanese opera exhibition, besides the introductory video, we have also created costumes and makeup areas, and a models photo-shooting area. Weekend theater’s performances and educational programs allow visitors to experience various facets of Taiwanese opera. Closing Day: Monday / Last day of the month (cleansing day ) / Public holidays. The Institute of Yilan County History was established on January 1st ,1992. It is the first county level regional history institute. Chief objective are collecting, recording, preserving and researching the regional historical origins, and promoting Yilan’s precious history. In addition to collecting numerous publications and information relevant to Yilan, the Institute also organizes academic activities such as publishing literature records, the "Yilan Research" academic seminars or study workshops and literature record exhibitions etc. We also cooperate with various academic organizations to conduct a series of research programs aimed at compiling a complete history of Yilan county. Increasing the public’s local knowledge and creating a civil-based historical framework are the long-term objectives of the Institute of Yilan County History. The Institute of Yilan County History’s new facilities were established on October 16, 2001, and are located next to the Yilan County Government building in a three-floor edifice with a rounded roof and high ceilings. The roof itself is covered with grass and small trees, resembling a small hill from a distance. Combining with the county government building and county council, a pleasant-looking scene is created. The Institute also provides a secured and convenient preservation environment for all historical resources. Everyone is welcome to visit and discover the historical treasures within. To meet the growing demands from outdoor school education programs, the Institute also plays a role as an alternative history classroom. All are welcome here to access, experience and even directly interact with history. It is a "living-space associating the people with the domestic history". Visual records such as books, genealogy, obituaries, educational history materials, official documents, maps, inscriptions, ancient books and photos. Basement: Books collection and library. Ground Floor: Regular exhibition and thematic exhibition areas. Public transportation: Take the King Bus to Luodong from Yilan station, get off at the Yilan county government station, then walk for 5 minutes. Driving: Drive along the Provincial Route No.9, then turn at the road in front of the Yilan county government building and head straight to the Institute. Monday / Last day of the month ( cleansing day ) / Public holidays. Memorial Hall of Founding of Yilan Administration was originally official residence of magistrates. In the garden, there are giant trees and the most prominent one is a valuable old camphor tree of more than 100 years old. However, preserving one old tree would not make sufficient sense to the preservation. This building itself is the witness of the political development of Yilan and has its irreplaceable historical value. Therefore, the Yilan County Government decided to retain the building in its Nanmen Project and restore to its original features and make it the Memorial Hall of Founding of Yilan Administration, giving new life to this old building. Group visitors are requested to make reservation. We reserve the right to control visitors when the number of visitors is high. Located at the Yilan Zhungshan Park, the Yilan Performing Arts Center was established in 1997 and officially opened to the public in 1998. The roof of the center is made of green steel, the walls combine South Fuchien bricks and grey-purple Yilan stones while the pillars are inlayed with handmade ceramic panels, revealing through wonderful patterns and colors the poetry of the Yilan opera style. The building stands as a memory and cultural record for next generations. The bright colors and unique regional opera style of the performance hall reveal Yilan’s new cultural character. The architectural concept of a "culture park" was designed to transmit a sense of diversity in performances, from Taiwanese opera, luo-di-sao, marionette theater, lion dance, bu-ma-cheng, Beiguan, children theater, Atayal and Kavalan tribes celebrations and dances, the characters and scenes of classical operas, such as "Kong-cheng-ji," " The Journey To The West", "Sze-Lang Visit Mother" to the numerous costumes, props, equipments and the performers appearances, all fold into an arrangement aspiring at blending themes and colors to reveal the rich variety of Yilan’s opera tradition and culture. In terms of interior design, the Yilan performing hall's stage adopted a combined mirror frame and open stage design, which is the very first three-sided stage in Taiwan. In addition, the "Beethoven audio-feel obstacle free system" gives the deaf people a rare opportunity to "feel" the marvelous sounds in the performing hall. In addition, the performing hall is directly linked to an open-air theater, utilizing the rehearsal room as the backstage. The small earth mounds in the park are ideal to accommodate the audience for outdoor performances. Driving: Drive along the Provincial Route No.9, enter Yilan city, and then continue along Zhongshan Road, pass the roundabout and turn left to arrive at the Yilan Zhongshan Park. Opening hours depending on performance. (Office hours: 08:30～12:00　13:30～18:00 Monday to Friday). Monday / Last day of every month ( cleansing day ) / Public holidays. Fares vary according to performances.